This Martin D28 has serious fret wear but only on the first few frets. Fret wear, just on the lower frets, could be a result of either: (1) Over playing the “open chord” area of the fingerboard. (2) High action at the nut causing wear due to the high string tension at the fixed end of the string. This is a very common problem on acoustic guitars and is generally remedied by honing and re-profiling all the frets (skimming down to the lowest point of the most severely worn fret). If the fret wear is too acute a re-fret is the solution or in this case a partial re-fret. 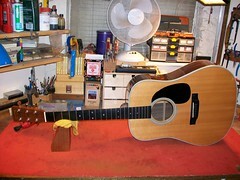 Replacing the first five fret would remedy the problem with this particular D28.